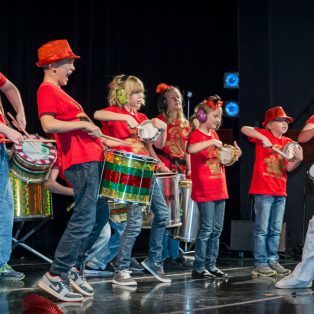 Samba school Papagaio offers weekly samba percussion classes for beginners and for more advanced players. Everyone has it in them, the rhythm just needs an outlet, so why not try samba? Bateria is the heart of the samba school. Without it, there would not be music, dancing or carnival! Bateria Papagaio is looking for new players to join our samba percussion group. No previous experience is required, we will teach you all you need to know. Anyone can play, and we even have a group for younger players. You are welcome to join us anytime but the best time join up is at the beginning of the Autumn season. Our teaching language in all dance and percussion classes is Finnish but it is possible to ask questions in English. Our bateria Papagaio performs in events year round. The culmination of the samba year is Helsinki Samba Carnaval – playing with a large group of ritmistas* in front of tens of thousands of people is an unsurpassable experience! Learn all the basics of samba percussion and Brazilian music in our weekly beginner’s classes. A bateria comprises of a variety of percussion and melodic instruments that together create the essence of carnival samba. Anyone can play samba and there’s an instrument for everyone. We welcome everyone – samba belongs to all! No prior experience is required and we provide the instruments, just have fun and enjoy yourself. More experienced samba percussionists also attend the classes, both to learn more and to help beginners. Moving from beginner’s classes to the advanced classes is possible as soon as Mestre de Bateria encourages it. At this point a “ritmista” would’ve found their instrument and can already follow the high tempo of the show bateria. 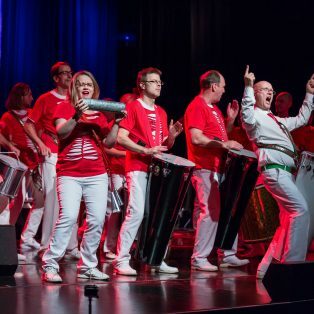 New and current performance material such as samba-enredos (carnival samba arrangement), demanding rhythm patterns and other rhythms such as samba-funk are learned and rehearsed in the advanced classes. Bateria Papagaio’s style follows that of one of the oldest samba schools in Rio de Janeiro, Estação Primeira de Mangueira, but we also study material from other samba schools. And of course we learn our own songs we compose each year for the Helsinki Samba Carnaval. Bateria’s Spring season is dedicated to preparing for the carnival: learning the song, parading, playing in sectionals and in a very high tempo. The only way to get to parade and perform is through the advanced bateria classes. New ritmistas are also welcome to Papagaio’s samba family. Banda Reggae Papagaio is a sub-group of Bateria Papagaio focusing on samba reggae and other Afro-Brazilian music. For additional info, please contact kari (at) papagaio.fi. Papagaio Bateria Mirim is the junior wing of the Papagaio drum section for drummers aged 10-15 years. Banda Reggae Papagaio (BRP) is a part of samba school Império do Papagaio.